Intrigue and politics. Artistry and adventure. Festivals and food. Welcome to the center of the world – Florence! Hot Spots: Renaissance Florence is your tour guide through one of the most exhilarating locations in history, the cradle of the most explosive intellectual and artistic era the world has seen. Florence! For fans of history, the name conjures dozens of adventure possibilities; those with only a dim memory from a long-ago classroom have yet to know of the city's mystique. This book is designed to cater to both groups – scholars and neophytes alike will find themselves enlightened. 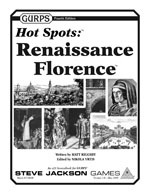 No mere travelogue, Hot Spots: Renaissance Florence has been designed for gamers first. Mostly generic (with a smattering of GURPS information), it's full of useful and interesting information – history, notable people, places of interest, laws and politics – that makes the city come alive for roleplayers. Each section also contains one or more adventure seeds that can turn those facts into encounters that will immerse heroes in Florence's charms and intrigues, while a detailed "Campaigns" chapter gives ideas for how to work the city into an ongoing game . . . including many unusual ways to incorporate Florence into other settings! With Hot Spots: Renaissance Florence, history isn't just something to be read about – it's waiting to be made. Check out the full GURPS Hot Spots line for more historical settings. 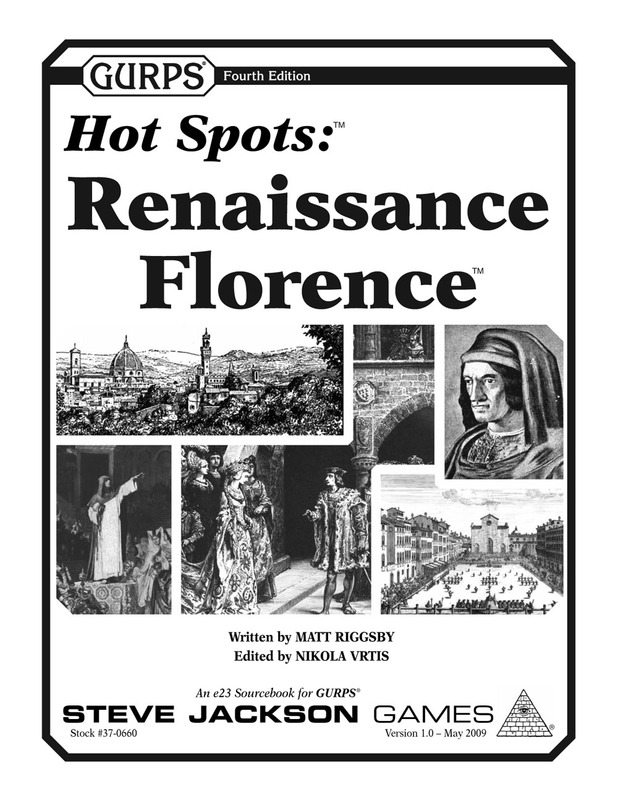 GURPS Hot Spots: Renaissance Venice is especially useful to learn about their rival city across the peninsula! For a noble Renaissance villa (with maps), check out Pyramid #3/117: Hot Spots.